Kihei Garden Estates offers affordable and central vacation rentals in the heart of Kihei Town. If you are looking for value in condo accommodations in Kihei, Kihei Garden Estates will impress you. This vacation rental property is situated excellently. It is located directly off of South Kihei Road so it is close enough to be a part of the Kihei scene but distanced enough to offer a serene setting. Across the street, you will find the soft and sandy Waiohuli Beach. With the pulse of Kihei at your fingertips, a super convenient beach, and well-appointed condos, Kihei Garden Estates is a South Maui stand out! 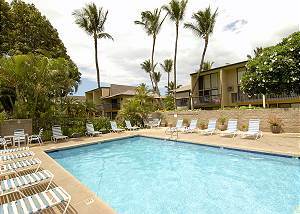 Kihei Garden Estates consists of 84 units surrounding a flourishing tropical garden. From your condo rentals private lanai you will have views of fragrant and flowering vegetation with alternating views of Haleakala. This quaint Hawaiian hotel resort will not disappoint. Stylish one bedroom condominiums will be your home base. In the center of the property, hidden in the garden, you will find a sparkling pool ready to revive you. There is also an oversized hot tub for you to enjoy. A barbecue area under a covered pavilion provides the perfect amount of sheltering and openness for you to grill for the family. When it comes to location, Kihei Garden Estates is supreme! Within a few minutes' walk, there are numerous dining establishments, shopping opportunities, nightlife, and activities. The charm of Kihei Town will win you over. The pleasant Waiohuli Beach is a terrific place for a variety of different Ocean activities including but not limited to swimming, snorkeling, sunbathing, stand up paddle boarding and kayaking. From your position at Kihei Garden Estates, the luxury facilities of Wailea are just a ten-minute drive, and the boating tours and activities of Maalaea Harbor are about fifteen minutes drive. Kihei Garden Estates is Maui's best kept secret! 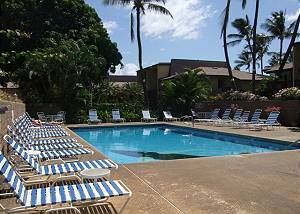 Chose Kihei Garden Estates for reasonably priced vacation condo rentals in the center of Kihei Town. 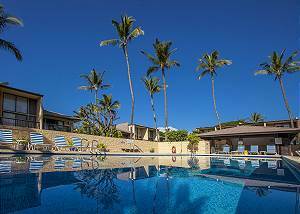 With a winning location, uncrowded beach, and quiet accommodations, Kihei Garden Estates is going to provide a fantastic atmosphere for your Hawaiian vacation. Book now to experience Maui the way it was meant to be experienced!